A Swiss military court has sentenced a former soldier for fighting against the Islamic State group in Syria. 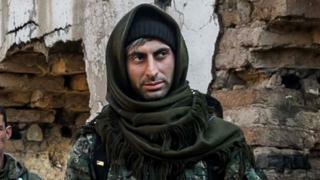 Johan Cosar used his military training to recruit hundreds of men to defend Christian groups from IS. He was found guilty of undermining Switzerland's neutrality and security by joining a foreign army - and given a three-month suspended sentence and fined 500 francs (£383; $500). Cosar made no attempt to hide his actions, and remains proud of them. He says he plans to appeal the sentence - which is relatively lenient when compared to the maximum of three years in prison. He was born in Switzerland, and is a Swiss citizen. But his grandparents have Syrian roots, and the Cosar family are members of the Syriac Christian community. After returning from Syria, he was arrested and charged under Switzerland's military penal code, which forbids Swiss citizens from serving in foreign armies. The verdict reflects similar sentences handed down to other Swiss men over the last 10 years, most of whom joined the French Foreign Legion. At the outset of the trial, an army spokeswoman said: "The law forbids fighting for a foreign force. Who that force actually is, is irrelevant." Now 37, Cosar says he originally travelled to Syria to work as a freelance journalist, but when he saw that Islamist groups were advancing on Christian communities he felt he had no choice but to defend them. He helped to found the Syriac Military Council, recruited for it, and readily shared the military skills he had learned in the Swiss army, among them weapons training and setting up checkpoints. At the height of the fighting, he was in charge of more than 500 men. But joining a foreign army without the explicit permission of the government is forbidden under Switzerland's military penal code. There are good historic reasons for this law: for centuries young Swiss men left their then-poor country to fight abroad. Swiss mercenaries were recruited by Napoleon, by Spain, the Netherlands, and even the British. But once Switzerland established itself as a neutral country, its government decided it could be awkward to have Swiss men fighting on multiple sides of Europe's wars, and forbade the practice. Today just one vestige of the Swiss mercenary tradition remains: the Swiss Papal Guard in Rome. The opening of Cosar's trial was greeted by a small demonstration of his friends and family, carrying banners proclaiming "fighting Islamic State is not a crime." Cosar himself has suggested he deserves a medal, not a trial, because he was "fighting terrorism" and protecting Christian minorities in Syria from, he believes, certain death. The atmosphere inside the courtroom was described as relaxed. Switzerland's government, however, does not want to send a signal that fighting in foreign wars will be tolerated in any circumstances at all, however "honourable". Dozens of Swiss citizens have travelled to Syria to fight for IS, or to marry the Islamist group's soldiers. A few are already back and in prison. Others are still in northern Syria, together with thousands of other foreign fighters, detained in camps run by Syrian opposition groups. Like countries across Europe, Switzerland is agonising over what to do about them. Fighting for a banned group like IS carries a much stiffer prison sentence of up to 20 years. Switzerland's justice minister said this week she would like Swiss foreign fighters to be tried "on the spot" in Syria rather than back in Switzerland. No-one, however, seems quite sure how that would work. The Swiss government is due to announce its policy on foreign fighters next week.